What does your job shop have in common with Pike Place Fish Market, the Seattle landmark where they throw fish to customers? Hold the fishy smell jokes, please. According to Shoptech’s business development manager, Gerri Schuh, we all can take a cue from that famous fish market and learn some big lessons on how to motivate your job shop employees. Gerri is responsible for leading our telemarketing sales team and connecting prospects with the E2 Shop System. She has extensive experience training and motivating c ustomer service and sales teams for leading national banks, a world leader in life insurance, and other service-oriented businesses. Over that time, she’s learned a great deal about motivating sales and customer service teams. She’s a champion of the FISH! approach to employee motivation and is applying it with swimmingly strong success here at Shoptech. The great thing about the FISH! philosophy is that it can be effective in nearly any type of business, including your job shop. That famous fish market uses this philosophy as a framework for serving customers. It doesn’t just apply to external customers, though. You can also adopt it as a framework for serving your internal customers – your shop team. Adopting the FISH! philosophy can help you motivate your team and maintain an enthusiastic and positive attitude on the shop floor. Good attitudes often equal efficient performance. And we all know improved efficiency leads to a better bottom line. What is the FISH! philosophy? 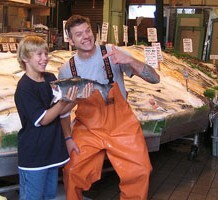 It’s based on the management approach utilized by the Pike Place Fish Market in Seattle. You’re probably familiar with Pike Place, even if you’ve never been there. It’s the place where employees enthusiastically throw fish across a counter to waiting customers. Here’s a slide show overview of the FISH! way. As you can imagine, attitude is important at Pike Place. Employees don’t just grab fish out of a cooler. They put on a performance. They create a memorable experience for customers. That’s what separates them from the dozens of other fish markets in the area. It’s a spirited, vibrant atmosphere that makes a customer even wish he or she were part of the team. If an employee-motivation program can make smelly fish fun, just imagine what it could do for your operation. Provide amazing service that makes customers want to come back again and again. Build a culture where employees love to give their best. Build effective leaders who inspire through their example. Improve teamwork and build trust. Your job shop employees probably don’t put on performances for your customers. In fact, they may not ever come face-to-face with your customers. However, that doesn’t mean that their attitude and level of motivation isn’t important. Motivated employees work harder, safer, and faster. In short, they boost your bottom line. You can implement the FISH! philosophy in your shop and see immediate results. Beyond your sales staff, everyone at your shop has ‘internal’ customers he or she serves. If you approach your fellow workers – especially the ones who count on you to deliver – as customers, your attitude, individual and team performance can improve. Both Gerri and I believe that people naturally want to do a good job. When you see a discouraged employee or a worker with a negative attitude, it’s often not because they don’t care about work, but rather because they don’t feel they’re capable of doing the work to the best of their abilities. Empowering employees with the right training can go a long way. Give them the knowledge and information they need to do their job well. Align their responsibilities with their skill sets so they’re in position to succeed. When they hit a roadblock or a challenge, work with them to get through it. Even well-trained workers can get frustrated if they feel like they don’t have the right tools for the job. When you invest in equipment, you’re also making an investment in your employees. You’re providing them with everything they need to be successful. From staplers to CNC machines to manufacturing software, give them the tools that they need. Improved communication is probably the fastest and easiest path to motivating your employees. Workers get frustrated when they feel like their voice isn’t being heard. Something as simple as a suggestion box can go a long way towards improving communication between shop workers and management. Ask your workers for suggestions on how the shop can improve. Then, implement those suggestions that are feasible. If a suggestion isn’t possible, don’t ignore it. Rather, explain why it can’t be done now and whether it’s a possibility in the future. Simply showing that you listen to your employees and consider their ideas can significantly improve motivation, attitude, and teamwork. Issuing bonuses and rewards are a clear way to improve motivation and attitude. However, if you’re going to implement a bonus or reward system, make it clear. Employees should know exactly what they need to do to earn a reward. They should also know exactly when that reward will be paid. The last thing you want is for an employee to feel like he or she earned a reward and then have to tell them that they didn’t. That could actually hurt your team’s motivation. Make your employee goals simple, clear, and attainable. If you do, you’ll see them work harder to hit their targets. Finally, recognize your employees for their hard work. Often, just telling an employee that they did a good job can significantly boost morale and motivation. Recognizing employees in front of their co-workers is another great tactic because it motivates not only the employee receiving credit, but also those who witness the praise. You can do this either through a formal recognition program or by simply walking around and telling employees that they’re doing a great job. Most successful companies do a little bit of each. They have an “Employee of the Month” type program, but also hand out special recognition when it’s warranted. Shop jobs can be hard work. That doesn’t mean your employees have to be disgruntled or discouraged. Make it fun and make it positive. If you do that, you’re likely to see the results in your shop’s performance and its bottom line.